This post is for our Illinois PBS users. We hope you find it useful. The State of Illinois is now requiring that all Illinois based employers report their employee W-2s by e-filing. Passport Software is now providing a solution for this. Here is a document from the state explaining the new requirement. If you have not already done so, you will need to register with the State of Illinois in order to E-file. Do this as soon as possible. The instructions for doing so are found on this web site. Passport Software has produced a specific Payroll E-filing solution for Illinois employers. The solution is based on specifications found on this site. • Your Payroll data must be in PBS version 12.05.03. • Install the programs specific for Illinois e-filing. Passport support can help you with this if you need it. The program is PR120503-IL.exe. If you need a Linux version of the install contact Passport support. 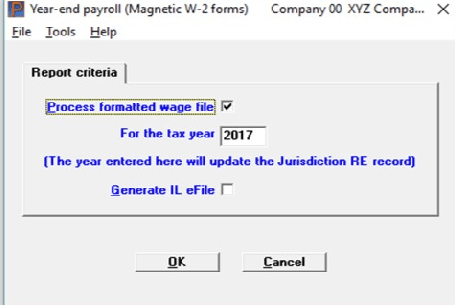 • If you have not done so, enter Jurisdiction information which is found on the Payroll menu under the Master information menu. • You should make sure your employee’s data is ready for W-2 reporting. 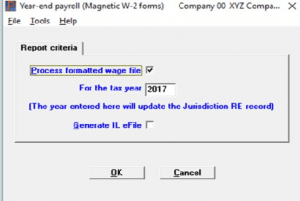 Verify this by running the Year-end payroll report, found on the Reports, general menu. If you entered some data specific for year-end also select Print W-2 information on the Year-end menu. Finally, you may also verify the data by printing the employee W-2s. If there are corrections, this is done by entering and posting an adjustment. This field must be checked. This must be the tax year for which you are reporting. This field must be checked for Illinois reporting. 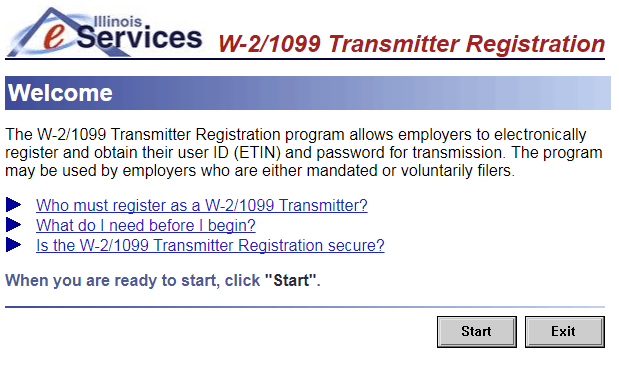 If you do not check this field the program will generate a Federal e-file with no Illinois specific data. Select the OK button. A report is printed. If the data is okay, the program will generate the e-file and print a summary of the data. If there are errors with address information, the social security number, the employee name and other data, an exception report prints the problem data. Correct the data and generate an e-file again. An e-file cannot be generated until the data corrections are made. After generating an e-file, a totals screen displays. Close this screen and the e-file generation will be complete. Lastly you must upload the file to the State of Illinois web site. The location of the file is in the top-level PBS folder and is called W2REPORTIL. Page 3 of this document provides two methods of transmission. We recommend that you use the Simple web file upload. If you have questions about this step call the State of Illinois for help. This site could also be helpful. Learn more about Passport Business Solutions. Or Contact Us – We are here to help.